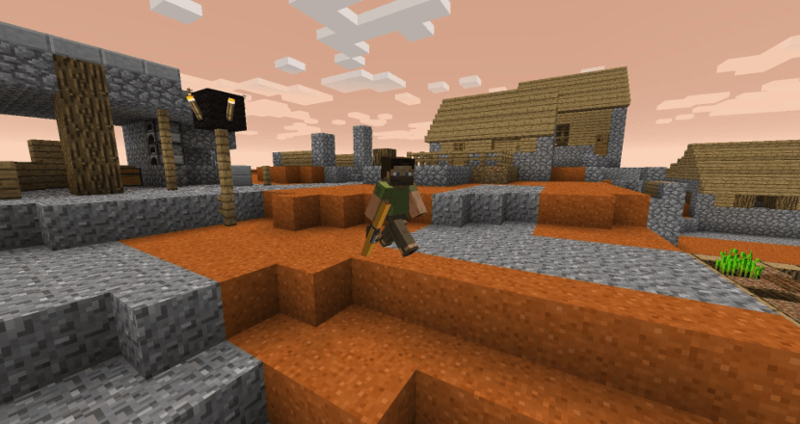 Minecraft is one of the most popular and sandbox games these days. This game focuses on breaking and placing blocks where people, at first, built structure for protection against nocturnal monsters. But then, when the game, grew players stick to working together creating wonderful and imaginative things and adventuring with friends. 1 What is Not Enough Items Mod? What is Not Enough Items Mod? 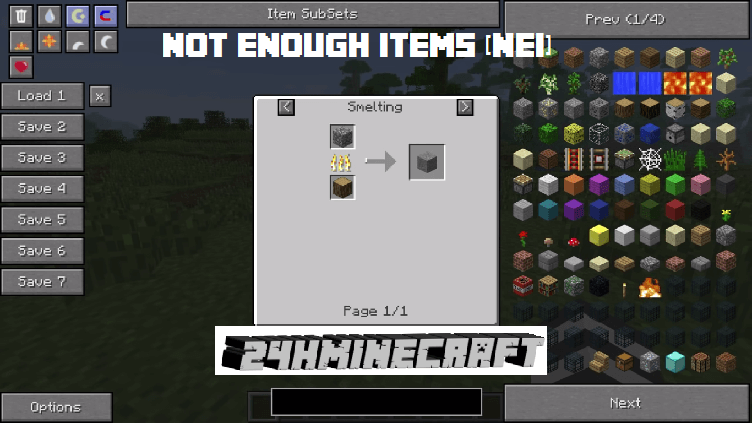 The Not Enough Items (NEI) is a successor of the Recipe Book as well we Too Many Items. It came down when people have become aware of the flaws of both Too Many Items and Recipe Book. Not Enough Items was created in attempt to make it easy for you to sort out among too many items and recipes. 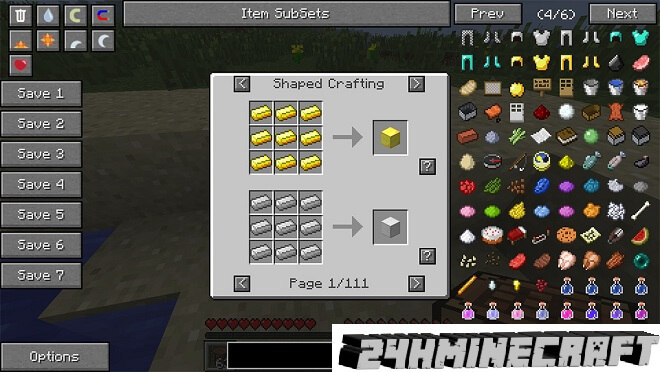 Not Enough Items 1.11.2/1.10.2/1.7.10 is a mod that allows you to add recipes and many other unique features loaded into your game. If you want to, it allows you as well to use some pre-loaded items in the Cheat mode, plus many other things. It gives you the ability to lock yourself into any mode that you choose, thus you can prevent yourself to use cheats. If you are a player who loves to play with lots of mods at the same time, then Not Enough Items 1.11.2 is just perfect for you since it comes with special ID Dump feature allowing you to solve ID conflicts. For someone who does not favor cheating, this may sound quite a bad thing. However, Not Enough Item’s Cheat Mode actually come pretty handy and without you actually cheating. 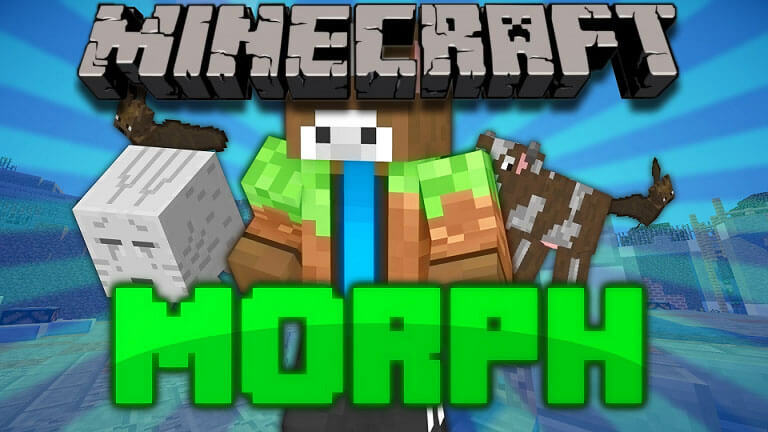 Basically, what Cheat Mode gives you unlimited items and blocks, allows you to change the weather, time, and even save inventories as a way of cheating the game. Moreover, with this mode you can easily heal yourself back to full health which is awesome. Or, you can instantly switch and go back to creative mode. The Recipe mode is actually the reason why the Not Enough Items mod is so often used. There are so many recipes ready at your fingertips, but the problem is it is hard to search through them all. But with Not Enough Items 1.8’s Recipe Mode, it makes it easy for you to search for the recipes either by name or through ID. If you do not want to cheat, then you simply need to lock yourself in Recipe mode and then not have the ability to load anything. This mode, on the other hand, is much like a companion to the recipe mode. With this, you can easily add two mode features to your recipe mode function. In that way, you can search for items and recipes simply ID or name. The utility mode adds features including the Magnet mode and Delete mode with the former allowing drops into coming directly to you, while the latter allows you to delete as many options. Recipe view contains 2 functions, Recipes and Usage. Pressing the recipe key (default R) or usage key (default U) while hovering over any item will take you into this mode. Once in recipe view clicking will bring up recipes and right clicking will show usages. The back recipe key (default BACKSPACE) can be used to go back to the last recipe and the Esc or Inventory key is used to exit. 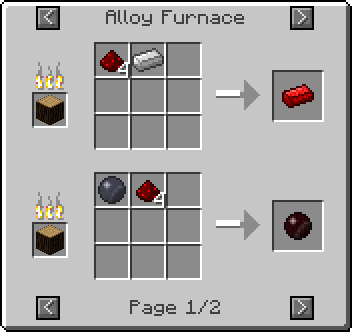 Recipe view shows you all the ways to craft that item, be it with a Crafting Bench, Furnace, Brewing Stand or another custom crafting inventory (Eg Alloy Furnace from RP2). 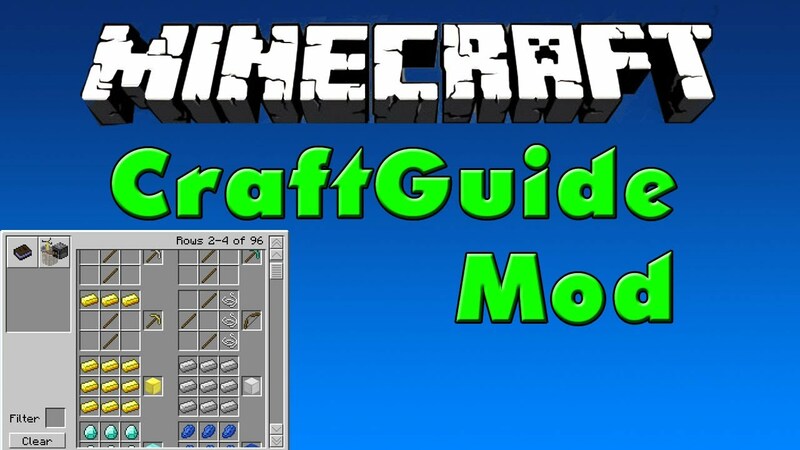 Unlike Craft Guide when a recipe can be made using multiple types of the same item (Eg the different colours of wool or the different types of wood), the ingredients will cycle through the available subtypes. So the wool will change colour. Usage mode shows you all the recipes that contain that Item. And it shows shapeless recipes too. The ? button will appear when the type of recipe matches the container you currently have opened. Eg. 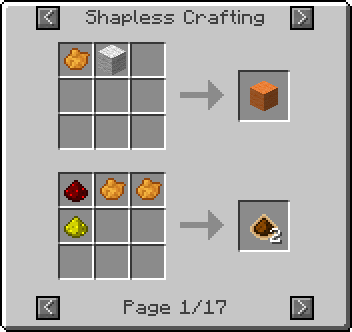 If you show shaped recipies while using a workbench. Clicking on this button will return you to the main inventory wher you will see highlighted overlays in the slots prompting you of which items to put where. The Item Search Box is the black bordered rectangle at the bottom. Only items that contain the text in the Item Search field will be shown in the Item Pane. The search box must be clicked on to start typing. Right clicking on the search box will clear it instantly. It is not case sensitive. Any search terms will be saved and loaded when you restart minecraft. The search box also supports wildcards * (any string of characters) and ? (any one character) as well as the complicated java.regex pattern matcher. As an example Bl?ck shows names containing Black and Block. Also ^Block would show items starting with block such as Block Breaker and block$ would show items ending with block such as noteblock or diamond block. The Item Subsets button is a dropdown menu containing many different grouped sets of items. Clicking on a set will show all the items it contains and right clicking will hide them all. Double clicking on a set will show only the items in that set. Mods can use the API to generate their own tag sets. Shift clicking on a set will type @setname into the search bar which will make the Item Pane show only items in that set. If you rightclick on the Item Subsets button the buttons for saving subsets will appear. These function identically to the normal save states, renaming, saveloaddelete, but they will save and load the items you have hidden and shown. By pressing the enchantment key (default X) you can bring up the enchantment selector gui. It allows you to put an item in the slot and select the enchantments and level that could be applied from an enchantment table. The level can go up to a maximum of X. Clicking on an enchantment toggles it on and off. (To prevent unnice bugs)The normal multiple enchantment conflict rules apply so you can’t have fortune and silk touch together etc. Unfortunately due to space limitations some names have had to be shortened, Projectile to Proj, Protection to Protect, Bane of Arthropods to Arthropods. Enchantment names will only be shortened if there is not enough space. Eg Protection will be shortened to Protect if you set level 8 because VIII takes up a bit of space. The trash can button functions in 4 ways. All operations apply both to your personal inventory and any inventory you may have opened (Eg a chest). 1. Click on it while holding an item it will delete the item you are holding. 2. Hold SHIFT while clicking on it with an item in your hand and it will delete all the items of that type in your inventory. 3. Hold SHIFT while clicking on it will clear your inventory. When trash mode is enabled any item you click on will be deleted. Holding SHIFT and clicking on any item will delete all items of that type. 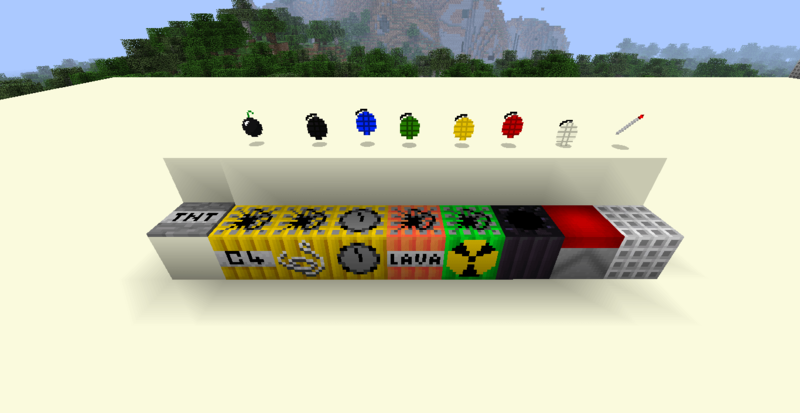 Clicking on the C button will toggle creative mode. This is self-explanatory. Simply change from creative to survival and back again. 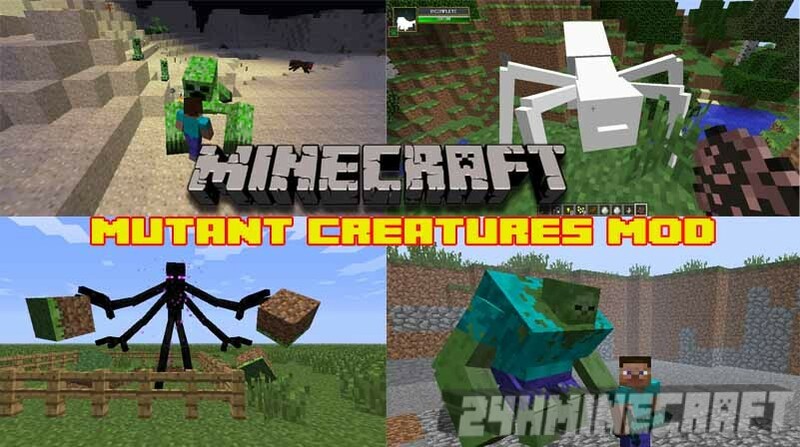 Note that on SMP servers this will change only you into creative mode and not the entire server. Again another self-explanatory button, if it’s raining right now this button will be enabled activated. Clicking it will change the rain to on or off. The last of the toggle buttons. When magnet mode is enabled any items within a reasonable distance will pick themselves up and fly towards you. Items wont be attracted if they can’t fit in your inventory though. The 4 buttons with the sun and moon are time set buttons. They will set the time to Dawn, Noon, Dusk and Midnight when clicked. These will only advance time forward to not break machines relying on world time. So if you click the day button multiple times it will keep advancing the days. The heart button will heal the player, fill the hunger bar and stop them burning if on fire. There are 7 save states capable of saving your entire inventory and armour to disk. Right clicking on a state will let you rename it. The x Button appears next to loaded states will clear them. Save states are a global feature that can be transferred between worlds and even servers. This is just the regular MC Style options configuration. It allows you to edit various settings and especially Key Bindings. The first Button Toggles wether NEI is Enabled or not. If it’s not enabled you wont be able to see anything except the options Button. The enabled state is separated for SMP and SSP. The Cheat Mode button toggles between Cheat Mode and Recipe Mode. Recipe mode is for playing legit and just using the recipe book component. The save states and cheat buttons will disappear and the Item panel will not spawn items into your inventory. Extra Cheats sets wether the Create, Rain, Magnet, Time and Heal buttons are to be shown. Item IDs toggles whether to show the ID of the item in the tool tip. This will work for all items in your inventory as well as the panel. This option will cycle between Shown, Auto and Hidden. Auto will show ID’s only when NEI itself is shown and enabled. This has the added use of showing you exactly how much damage a tool has sustainer. Eg the Sapphire Pickaxe below has taken 6 damage. Save states merely sets weather or not to show the save states, self-explanitory. If Item drops are disabled any EntityItems in the world will be deleted. So mining a block or dropping an item will give you nothing. Someone said they must have it for lag removal so I added it. The KeyBindings all do what they say. Click on them and then press the key you want to change it to. NEI makes all types of mob spawners obtainable in your inventory and place able. Any custom mobs you may have will also be assigned a spawner. The spawner item will show the entity inside of it just like the block. Hostile mobs will have Red names and Passive mobs Blue names. The bug in SMP where all mob spawners show pigs has also been fixed. Any users who have NEI installed (even if they are not Ops) on a server with NEI will be shown the correct mob. Ctrl clicking on any item in your inventory will give you more of it, just as if you clicked on it in the Item Pane. If you pick up an item and hold shift while placing it in a container then all items of that type you have in your inventory will also be put in alongside the placed item. 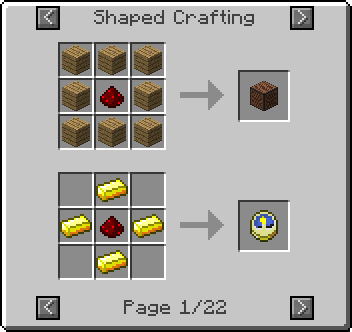 Useful for transferring all your cobblestone to a chest in one go. Everything that you can do in SSP can be done in SMP if the server has NEI installed. If not then NEI can still spawn items using the give command if you are an OP. Most of the features are only enabled for OPs. There are many options in NEI that can be configured in “configNEI.cfg”. Note that most of these are editable in the options menu. A configuration file will be generated in configNEIServer.cfg containing various confiutation options for servers. The config file comments explain the functions. In short it allows you to assign certain functions to be used only by certain players. So you can select who can use OP enchantments etc. There is also a banned blocks section, any blocks that are banned wont show in a user’s item panel. Bedrock is banned by default so connected users can’t spawn bedrock, (unless you specify their name). 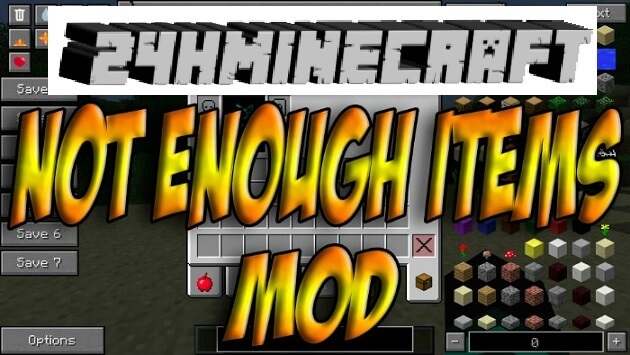 Download both Not Enough Items Mod and CodeChickencore.